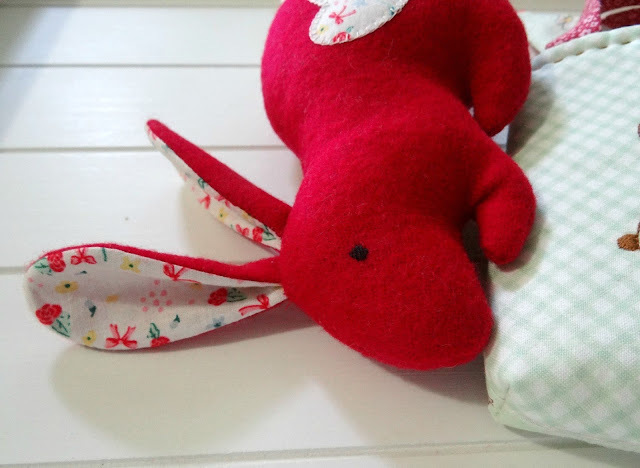 Today I actually made a few Easter toys I've wanted to sew for a long time but never actually gotten around to doing. 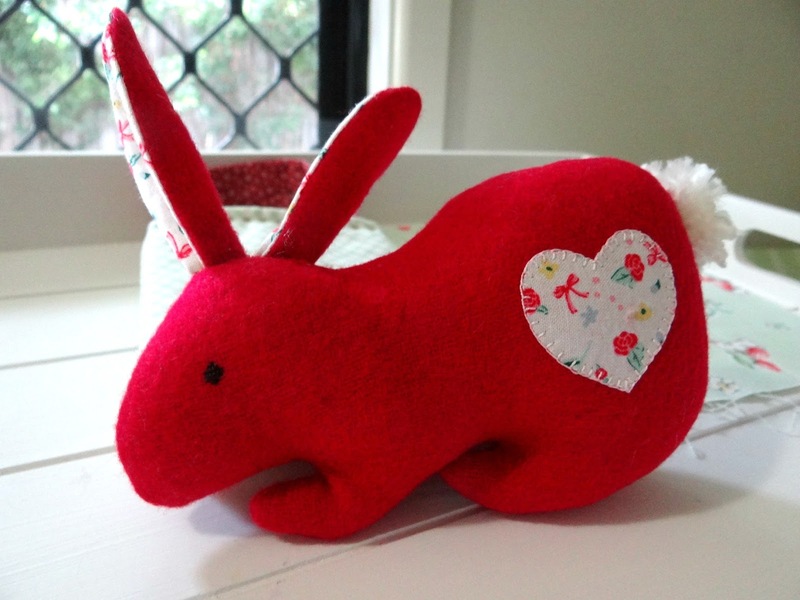 As Cully May cannot have any dairy and does not have sugar either, I've made her and Rafaella some soft bunnies for Easter from a piece of beautiful red wool fabric. It's long been hidden in my stash and only sparingly used, but was perfect for the two bunnies. 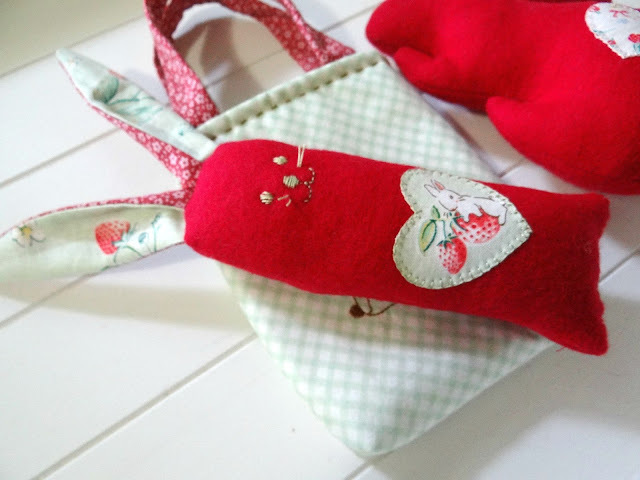 Before I made any bunnies though, I stitched a cute little bag for Cully. 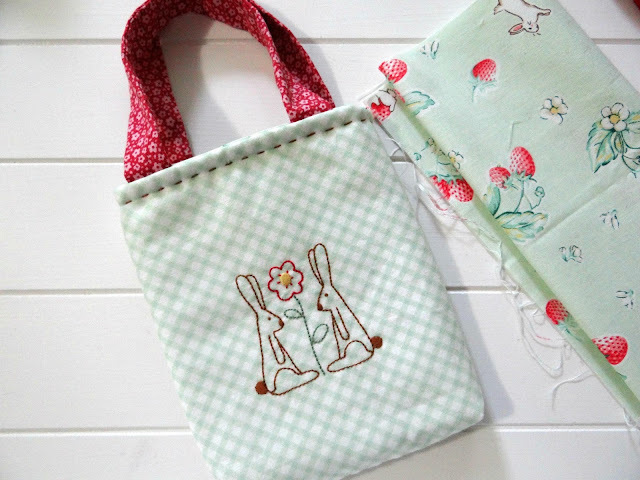 The stitchery is part of a larger one by Natalie Bird which I found in an old issue of Homespun, the fabric is from "Bunnies & Cream" by Lauren Nash, and I made up the bag pattern as I went along. 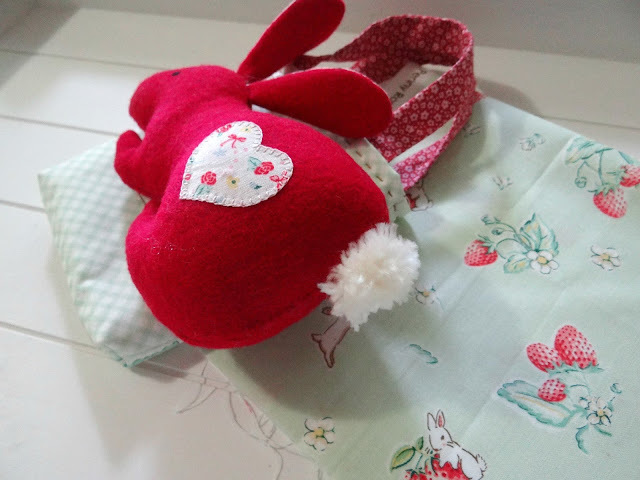 Once Cully's bag was completed I decided to make Rafaella a soft toy and used this pattern by Betz White, though I did alter a few things like making a fabric applique heart and not using felted wool. I just love the ears! This was also my very first attempt at making a pom pom! Blossom tells me Cully is obsessed with rabbits (as well as Thomas the Tank) so you never know, I may end up making more bunnies in the weeks ahead. Firstly, we didn't buy the children filled chocolate eggs, but the empty kind, and we'd crack those eggs open with a rousing shout of "Jesus is risen" because just like there was nothing inside the egg, so too there was no Jesus in the tomb. He had risen from the grave because death could not hold Him down. Secondly, as the children got a bit older we discussed the plentiful productivity of rabbits, their ability to bring forth an abundance of 'new life', and how because of Jesus' death and resurrection He made the way for all of us to have new life, eternal life, life far more abundant than any rabbit family. These are the truths dear Blossom will teach her girls in years to come, and I'm sure the Lord will give her even more things from His life to share with them. I won't be blogging tomorrow as we're celebrating Resurrection Sunday here at home with Blossom, Ross and the babies, so a day early you are receiving Block 4 of my BOM, "A Year in the Garden". 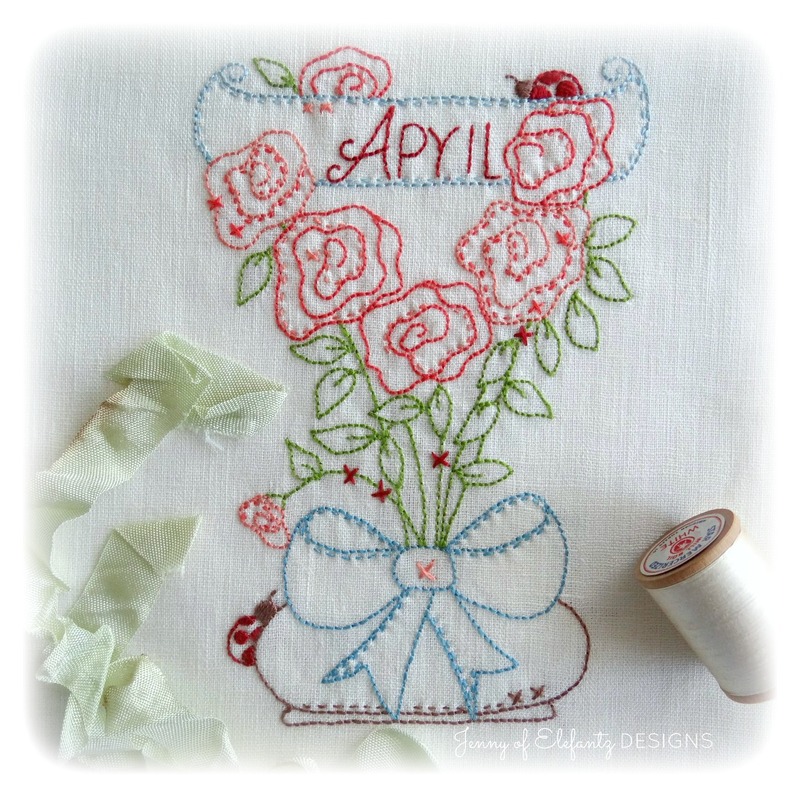 My friend Fee's birthday is in April and her favourite flowers are roses which is why I designed this block with both her month and roses. 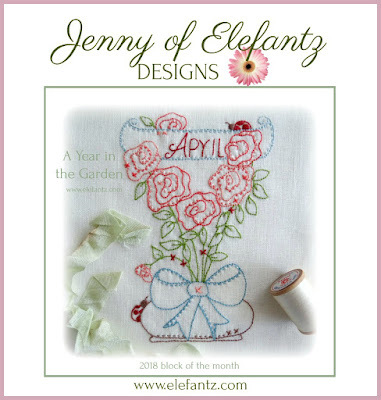 The April pattern is a free download HERE in my shop until April 30th. The previous three blocks are also in my shop as a $2 purchase. You can see all the blocks here. Thank you from the bottom of my heart for all the kind words, prayers, love and understanding you expressed in your comments and via email over my previous blog post. Truly, there is more love in the world than we know, and here in my little corner of it I felt overwhelming love from all of you when I was climbing my way out of the valley. Bless you so very much and may Jesus be your Light and Life this Easter and every day that follows, just as He is mine. Wishes for A happy and blessed Easter for you and your family . Isn't it wonderful to know that Christ not only died for us but also rose from the dead to give us eternal life. Happy Easter my Sweet beautiful caring Jenny and family. I know the girls will love their Easter goodies....and Cully might just bunny nap (kid nap ) Rafaella's bunny... But at least they will be well played with and treasured for years to come....Love the bags and bunnies my sweet friend. We will be having a lovely Easter dinner with our daughter and Son. Our sweet Savannah arrived home late Thursday night for the weekend. SO love my baby girl being home for the weekend. The bunnies are adorable! I'm sure they will become very popular. I really like the way you made your small bunny more than the link you shared. I've never seen Betz White's blog...so many treasures there! I'll be browsing through it as I have time. Thank you for the pattern. April is my birthday month as well & flowers are my favorite things. I also love your bunny illustration to teach to children. I'll be filing that one away. Hello Jenny; I have never heard another Christian who taught their children about the Resurrection of Jesus the way in which you have. Jenny, that is such a magnificent teaching message to begin at are children's early years. Bless you for sharing this and if I ever have Grandchildren, I hope that God let's me remember this message and that I can do the same for them. I adore the items that you have made. Each one is so adorable. I found a doll carrier pattern tutorial that I began making for my Great Niece, but my Mother found out that the airline was going to charge anywhere from 50 to 100 dollars for luggage. So she was trying her best to get a weeks worth of clothing into one carry on bag. Which I may just have to make her a stuffed bunny also. I want to also say that I am loving the BOM embroidery patterns for this quilt. Each of the patterns you have designed and shared have been so beautiful and especially comforting while I am slowly stitching. I am still on the first one. LOL. I have written you a letter once again my dear friend. Let me end with May the Lord be with you and your family while you are celebrating the Resurrection of Christ our Lord this holiday! Bless You! What a lovely post today, thanks for sharing with us. I do love what you have made for your granddaughter's. Have a lovely day. Happy Easter. Have a blessed Resurrection Sunday celebration. Happy Resurrection Sunday, Jenny, and all your family together. I will be thinking of you and hoping it is a day of great memories. 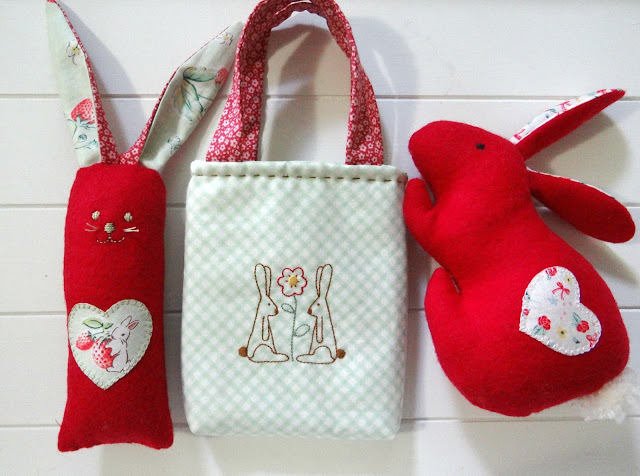 Your little bunnies and bags are wonderful - what a great idea to make Cully May her own bunnie! The bag and stitchery are just perfect, and I only wished I had your ideas for the empty Easter eggs and the abundance of new life. It would have added much to our family celebrations, too. My boys are OLD, and I still give them Easter morning presents to remind them of the importance of the day. 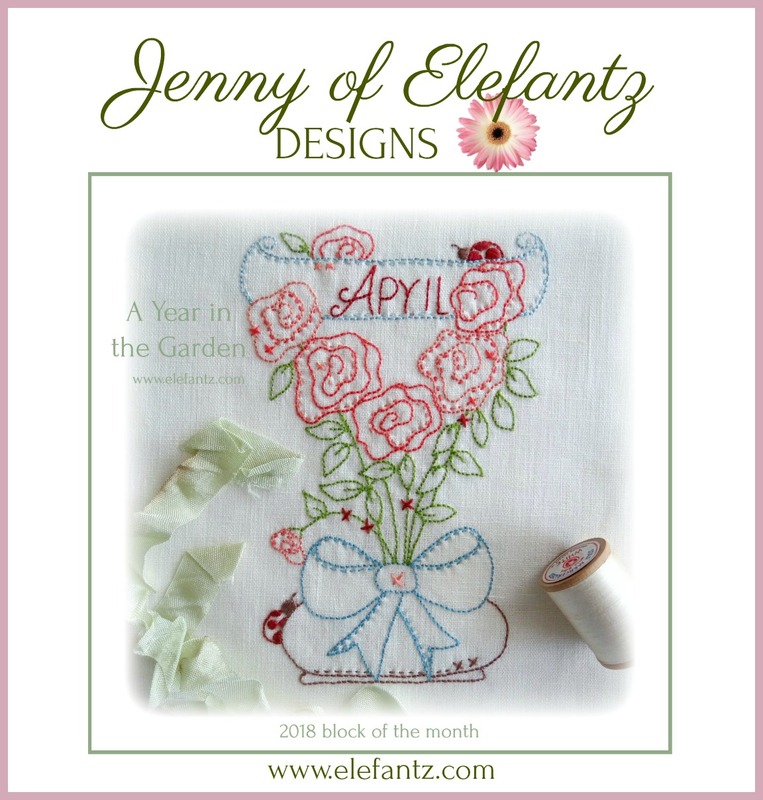 Your April block is terrific, and definitely perfect for spring, or in slightly different colors, for summer, too! Thank you for a beautiful post and block. Maybe there's a pattern out there for a cuddly Thomas the Tank, too! Enjoy a blessed Easter with your beloved family! Your bunnies and bag are so adorable and certain to be loved by your grands! I hope you are having a blessed Easter Sunday with your family, Jenny. We weren't big on Easter eggs when the children were growing up. I love the bunnies you made. All my grandchildren, boys and girls, haved loved Thomas the Tank too. The Thomas DVDs are great for children to watch too. Ex-cyclone Iris isn't making her presence felt up there with heavy rain is she? I think your dam must be nearly full by now. I hope you have shared a lovely day with your family. Those bunnies are so cute and I love Cully May's little bag. I bet she takes it everywhere and puts lots of things in it. What gorgeous Easter gifts for the girls. Funnily enough, I was looking through some old Homespun mags yesterday and saw that stitchery. I hope you had an enjoyable family time together celebrating such a joyous event. How sweet are those - and I love the little bag!!! Love ya girl! I missed this post. 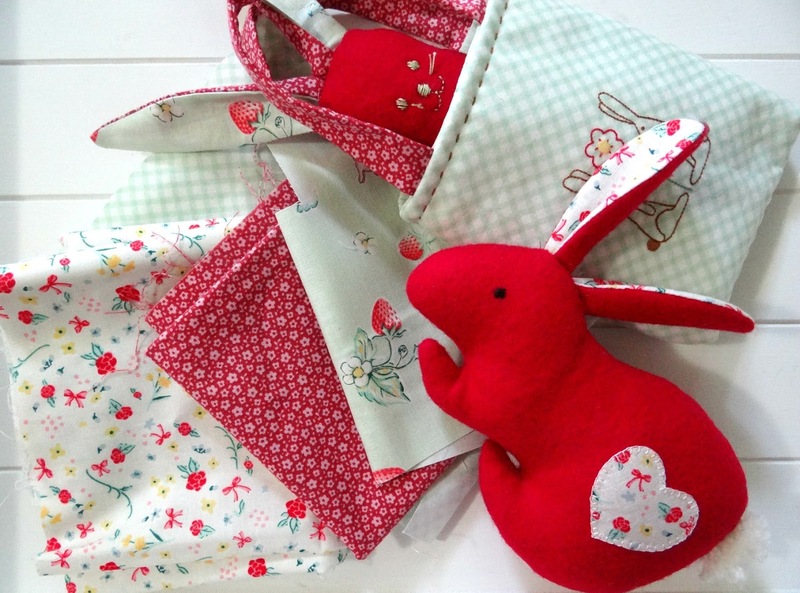 How gorgeous are your rabbit gifts for the girls. They are gorgeous, Jenny.